NKVD: The dreaded NKVD was the secret service of the Soviet Union. They had a reputation of no mercy and brutality and no one was safe from them. As well as acting as secret service, the NKVD also had rifle regiments and controlled all the border guards and security. RED ARMY EARLY SUMMER: In 1941 when the Nazis invaded Russia, the Red Army was in a terrible state in both organisation and equipment. Our range of Early Red Army Summer reflects the tatty appearance of this force that desperately tried to hold the German forces as the Soviets restructured and reorganized. Red Army Summer Late War: From 1943, the Red Army abandoned their new socialist uniform policy in favor of a return tot he look of the old Tsarist uniforms although still very much communist. The New uniform and helmet was much smarter and ranks were restored. With the new uniform also came success on the battlefield. Red Army Winter Late War: As the harsh Russian winters closed in the Red Army had a wide range of specialist uniforms to deal with the extreme cold and snow. Red Navy: The Red Navy often had to abandon their ships and fight as infantry. As the war progressed they often looked the same as the Army, early on there was a much greater mix of Naval and Army uniforms. 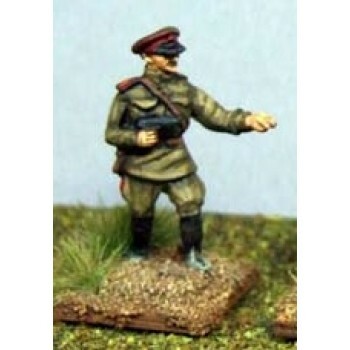 20mm WWII Elhiem x2 Soviet Russian Red Army NKVD Infiltration Agents in civilian long trench coats a..
20mm WWII Elhiem x1 Red Army Early War Driver in forage cap..
20mm WWII Elhiem x8 Russian Soviet sailors with a mix of rifles, SMGs, LMGs and grenades wearing a m..
20mm WWII Elhiem x8 Russian Red Army Combat Engineers in Armour includes 8 Sappers in the camo suit ..
20mm WWII Elhiem x8 Russian Red Army Riflemen in the late war Red Army uniform with blanket rolls an..
20mm WWII Elhiem x8 Russian Red Army SMG Infantry w/ Ppsh 41 drum magazines in late uniforms summer..
20mm WWII Elhiem x3 Russian Red Army Grenadiers in Winter Snow Suits preparing and throwing grenades..
20mm WWII Elhiem x4 Russian Red Army riflemen skirmishing in snow suits (can be painted in camo as s..
20mm WWII Elhiem x3 Russian Red Army FO in Winter Snow Suit (3 Figures) inc;udes 2x Soviet FO with S..
20mm WWII Elhiem x5 Russian Red Army in Snowsuit LMG teams 4 DP/DTs and ammo carrier..
20mm WWII Elhiem x4 Russian Red Army riflemen advancing in snow suits (can be painted in camo as sco..
20mm WWII Elhiem x4 Russian Red Army riflemen charging in snow suits (can be painted in camo as scou..
20mm WWII Elhiem x4 Russian Red Army riflemen kneeling in snow suits (can be painted in camo as scou..
20mm WWII Elhiem x3 Russian Red Army in Winter Snow Suit with Mosin Nagant rifles firing 1x 82mm Mor..
20mm WWII Elhiem x9 Russian Red Army SMG Squad in Winter 1 and 2 piece snow suits armed with 8x Ppsh..
20mm WWII Elhiem x3 Russian Red Army Snipers in Winter snow coveralls, felt boots and mittens armed ..